This last weekend, the College Place High School FFA represented at the Milton Freewater Jr. Livestock Show. They competed in many events and walked away with a few awards. Alex Zitterkopf was one of our 6 pig exhibitors. He placed 2nd individually for Greenhand Livestock Judging, sponsored by MF Elks Lodge. He also lead our tractor driving team with a 1st place individual award for Advanced division, sponsored by Pape Machinery. Marcus Huenergardt placed 3rd individual for the Advanced division of Tractor Driving, sponsored by Pape Machinery. 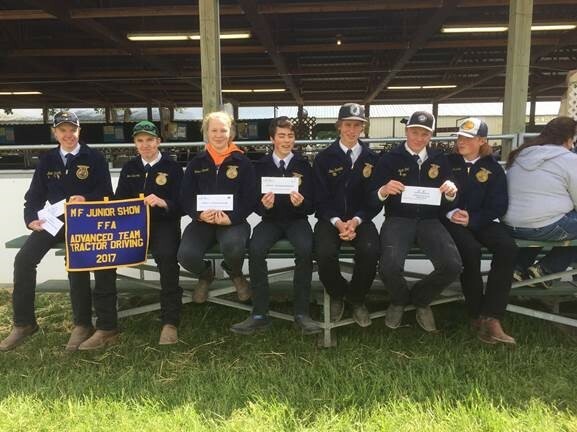 Alex, Marcus and Lane Floch were members of the 1st place Tractor Driving Team in the Advanced division, sponsored by Pape Machinery. Lane Floch was Grand Champion Senior 4-H Swine Showman. Hailey Reavis was Grand Champion FFA Ag 3-4 Swine Showman and Reserve Grand Champion All Around FFA Swine Showman. They all worked hard showed great sportsmanship.